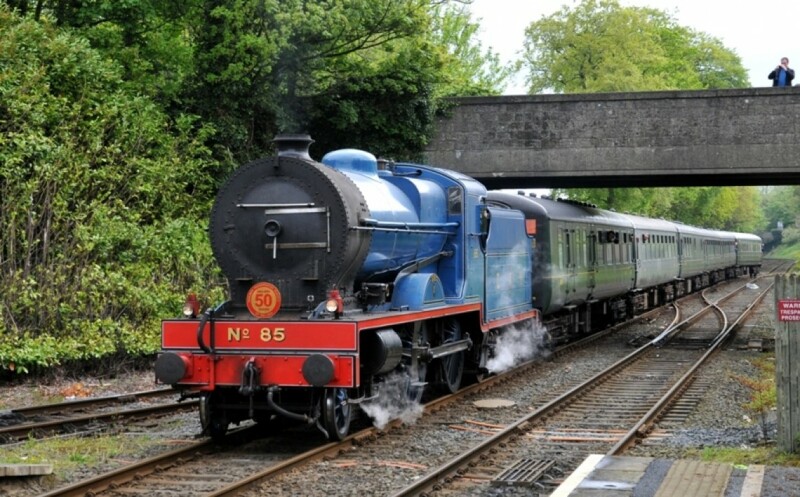 "V" CLASS 4-4-0 COMPOUND, No.85 "MERLIN"
No.85 was built for express passenger trains on the Dublin - Belfast line, the main line which links Ireland's two biggest cities. She is on long term loan to the Society from the Ulster Folk & Transport Museum at Cultra, Co Down, although her tender belongs to the Railway Preservation Society of Ireland. This locomotive survived the break up of the Great Northern Railway in 1958, ending her days on secondary duties in 1963 after diesel railcars had taken over express services. 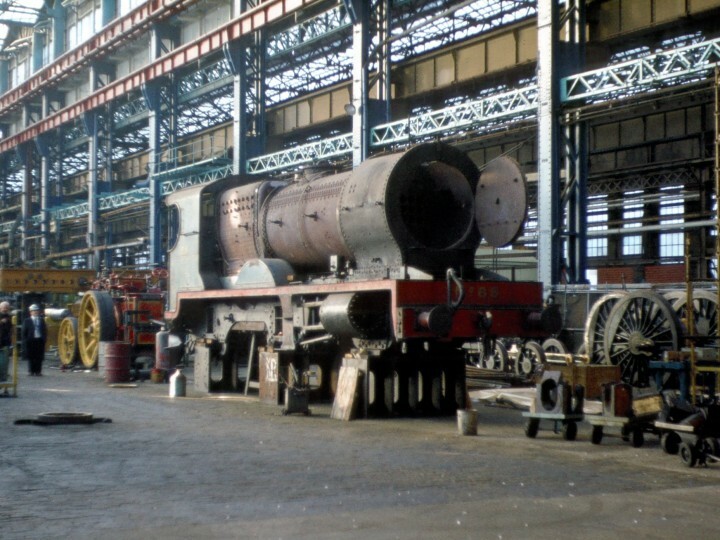 After a period in the former Belfast Transport Museum in Witham Street, Belfast (now part of the UFTM collection), she was loaned to the RPSI and underwent extensive renovation in Harland & Wolff's shipyard in Belfast between 1977 and 1982. 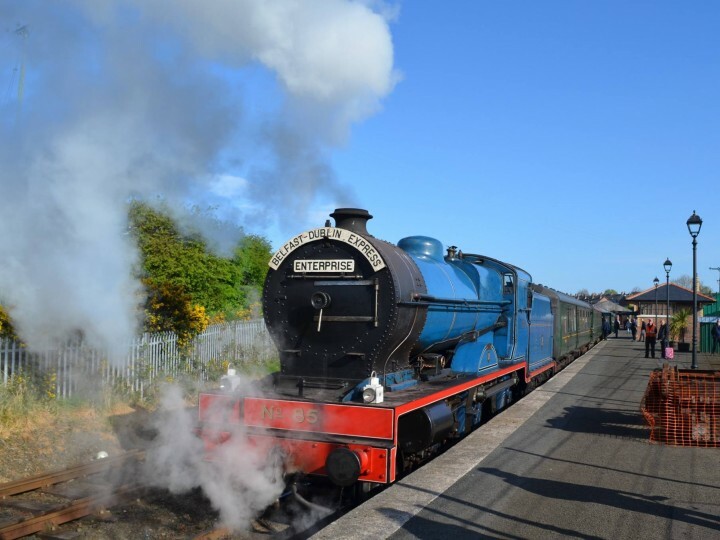 Since 1986, the RPSI has used her on tours all over Ireland, and she is one of only two surviving operational main line compound locomotives in the British Isles. As built, No.85 and her four sisters (all now scrapped) were unlined black, but the famous GNR(I) sky blue livery presently carried was applied from the mid 1930s. There's something very special about Merlin, the last remaining full-sized compound locomotive at work anywhere in the British Isles. There always was! Merlin dates from 1932, and is one of the Great Northern Railway (Ireland)'s famous V class 4-4-0s. The V Class were the most celebrated engines designed by George T. Glover, who before he became Chief Locomotive Designer for the GNR(I) in 1912 (a position he held until 1933) had worked for England's North Eastern Railway. Glover built all of his locomotives with superheaters and he also superheated all of the earlier GNR(I) 4-4-0s (apart from the Js) which he inherited. 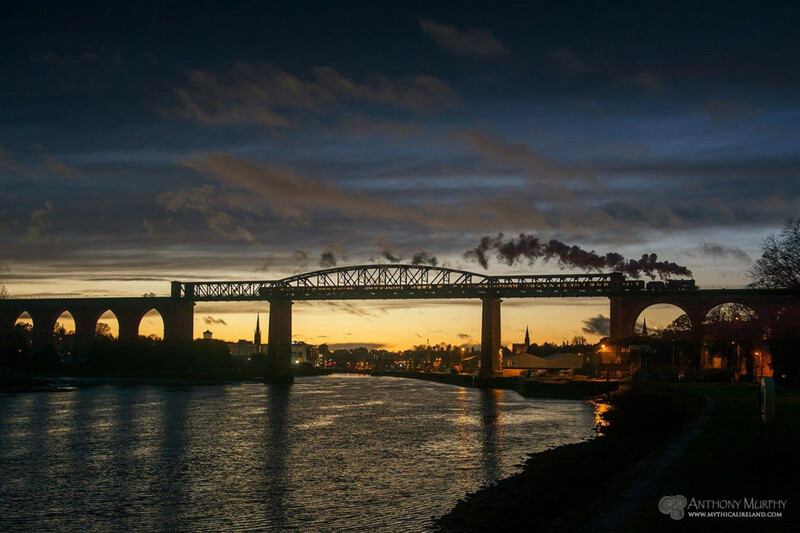 It gave the railway the largest proportion of superheated locomotives in Ireland at the time. The compound V Class locomotives brought much interest from the railway press when they were built. The first three-cylinder engines in the whole of Ireland, they weighed 103 tons 11 cwt including tender. For the time they were also unusual in having round-topped boilers and Stephenson's valve gear. More than 70 years on, Merlin has given pleasure to many people since the official launch of its preservation career in 1986 - and only ever experienced minor mechanical problems. 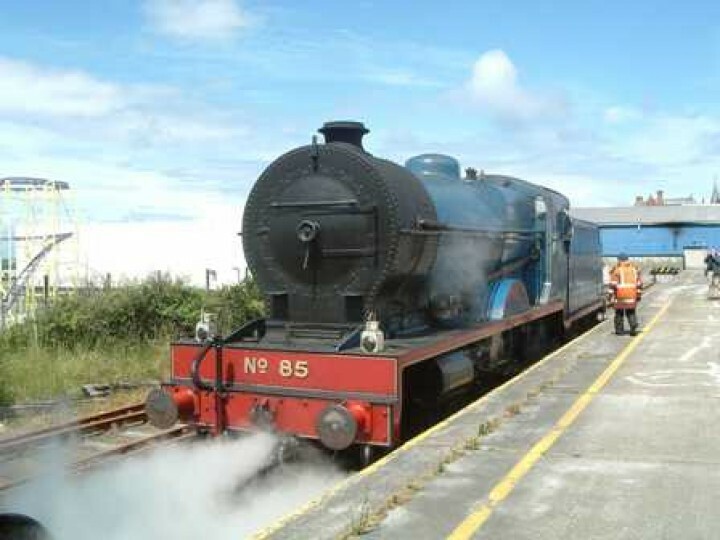 In fact, No.85 is one of the best in the Railway Preservation Society of Ireland stable, but then she is a GNR(I) engine after all! That we have Merlin to enjoy today is due indirectly to public pressure more than 70 years ago. The compounds came about as a result of public demand for better timing and standards on the main GNR(I) route from Dublin to Belfast. The locomotives previously working the service were old S Class (such as surviving No.171 Slieve Gullion) and S2 Class 4-4-0s which were giving trouble, particularly with broken crank axles. Raising the boiler pressure on these locomotives from 175 psi to 200 psi a bid to improve performance had increased power but also the maintenance needed and soon the pressure was brought back down to 175 psi. Something new was desperately needed. While the design for the V Class was being prepared, the GNR(I) sent men over to the LMS to experience and learn from the compounds in use in Britain at the time. 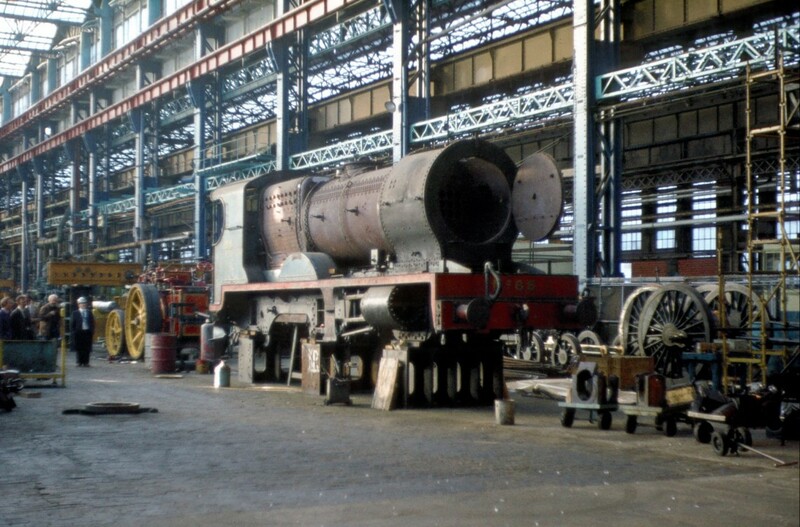 The main dimensions of the LMS design (one of which, No.1000, is preserved at York) included 6ft 9in driving wheels, a 19in x 26in high-pressure cylinder and two 21in x 26in low-pressure cylinders. The working pressure was 220 psi with a tractive effort of 22,649lb. However, the Great Northern design ultimately had 6ft 7in driving wheels a 17¼ in x 26in high-pressure cylinder, 19in x 26in low-pressure cylinders and 250 psi working pressure, which produced a tractive effort of 23,762 lb. Interestingly, both designs had the coupling rods outside the connecting rods. The compounds - or 'Pounders' as they became known by crews - were built during the Depression and cost £5,847. That was £3,000 cheaper than the same railway's SG3 Class 4-4-0, built between 1920 and 1922. The V Class engines were ordered from Beyer Peacock (without tenders, which were built in Dundalk) and delivered at weekly intervals between 9th April and 5th May 1932. They carried the numbers 83-87 and were named after birds of prey: Eagle (83), Falcon (84), Merlin (85), Peregrine (86), and Kestrel (87). The compounds were introduced before the start of the new accelerated times for the 112-mile Dublin-Belfast main line, which clipped up to 22 minutes off workings. These were tight schedules and severe maintenance problems arose: hot boxes, problems with connecting rods and even, soon, boilers needing a re-tube. As a result, the boiler working pressure was reduced to 200 psi, which brought the tractive effort down to just over 19,000lb. In 1946 the first rebuild took place when No.87 Kestrel received a Belpaire-style firebox, built by Harland & Wolff of Belfast. This was the first GNR(I) locomotive to have a Belpaire firebox, A new-style boiler was fitted to Merlinin May 1950 when the old boiler was rebuilt for use as a spare for the V and newer Vs classes. The GNR(I), which prided itself on its style and elegance, introduced a new non-stop service between Belfast and Dublin in August 1947. This train, the "Enterprise", still runs to this day - albeit without the style of a V or Vs at the head. The prestigious train was restricted to seven bogie vehicles and the inaugural service was hauled by No.83 Eagle, coupled to a 3,500 gallon tender for the run. During the early 1950s the 'Pounders' shared most of the heavy main line work with the newer Vs Class but, with the introduction of new railcars in 1957, the class was relieved of its main duties. 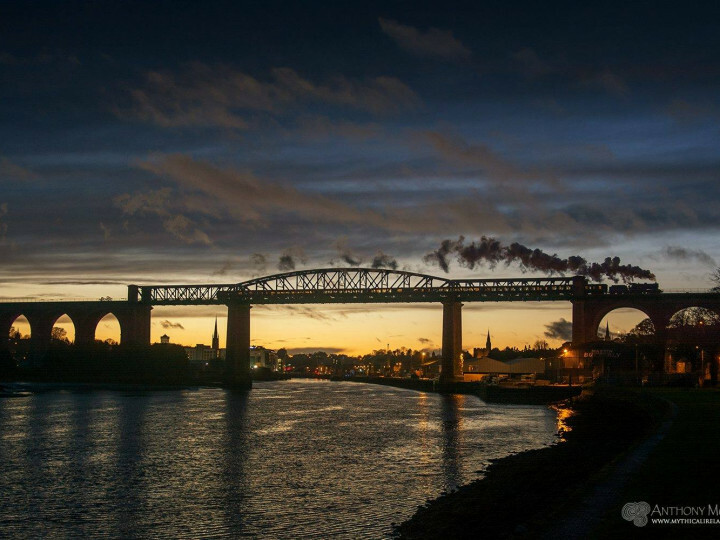 From October 1958 the old GNR(I), (actually now the Great Northern Railway Board, or GNRB) was split between Northern Ireland's Ulster Transport Authority (UTA) and the Republic's Córas Iompair Éireann (CIÉ). Compounds Nos. 83, 86 and 87 went to the UTA and Nos. 84 and 85 went to CIÉ, with the letters 'UT' or 'CIE' stencilled on the front buffer beam of the locomotives. Merlin spent part of 1958 in Dundalk works, eventually appearing with a Vs Class tender. With little work for the engine, the 26-year-old veteran was usually kept 'spare' around Dundalk, but did sometimes appear on the 12:45pm Dublin train and the 5:35pm return. Steam finished on CIÉ in 1963 and Merlin was inspected for possible purchase by the UTA. However, Vs Class No.207 Boyne was eventually purchased and went north instead. 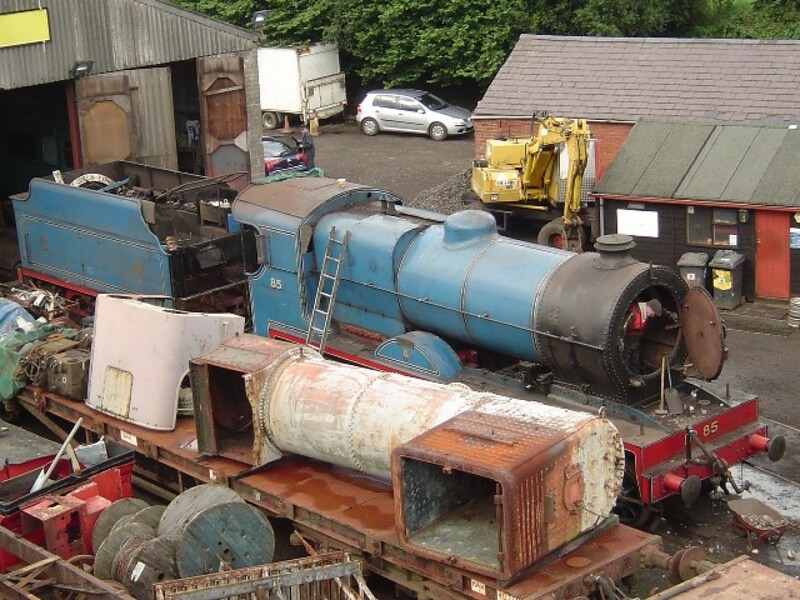 The rejected Merlin moved to Dublin (Amiens Street) and then to the city's Inchicore Works for scrapping. But it didn't happen. 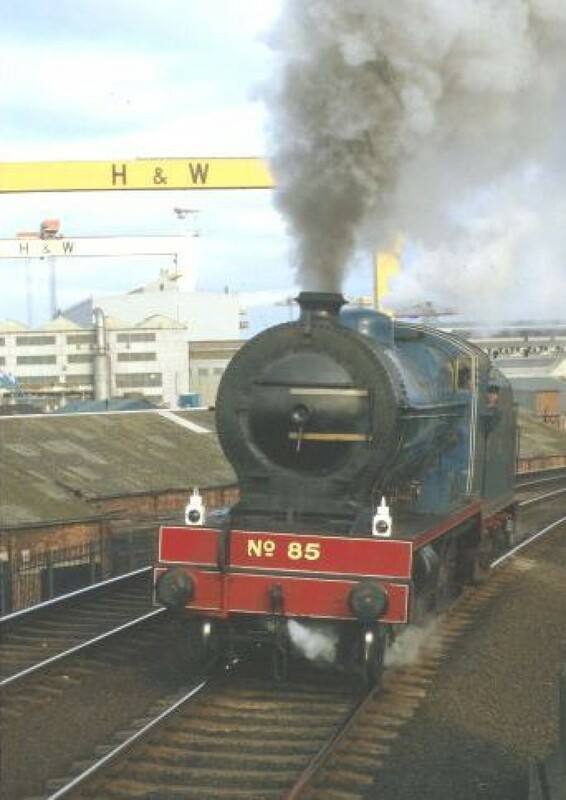 At the time the Witham Street Transport Museum in Belfast had plans to acquire the last of the compounds and in the end a purchase was agreed, with the locomotive (minus its tender) costing £600. Buffers and drawgear were fitted to the cab end of the engine and the 4-4-0 was moved from Inchicore to Amiens Street in April 1965, then to Dundalk the following month. It remained there for more than a year before mowing to Belfast's Adelaide shed. When Adelaide closed, No.85 moved to the goods store in Lisburn and it wasn't until late 1969, four years after purchase, that Merlin finally arrived at the museum in Witham Street. The compound was as displayed inside the cramped museum for nearly eight years until negotiations between the late Lord Dunleath, the Railway Preservation Society of Ireland and the museum saw it on the move again - this time to the engine works inside the Harland & Wolff complex at Queen's Island in Belfast. An overhaul followed which included replacing areas of wasted boiler plate, fitting new stays, new tubes, superheater elements, and glands and the repair of a crack in the cylinder block. Merlin then moved to the RPSI's Whitehead headquarters where the boiler cladding was fitted and the engine paired with a former Vs Class 4,000 gallon tender. It ran with this for a couple of years before it was replaced with a smaller 3,100 gallon tender. After a series of running-in trips in 1985 and 1986 Merlin was officially launched into traffic on 30th June 1986 by Lord Dunleath who himself drove the locomotive through a red tape, marking the start of a new career for the newest locomotive in the RPSI stable. On 13th September the dedicated people who had travelled behind, timed and worked on this magnificent machine saw something they'd thought they never would again: Driver Billy McCaughley and Fireman Jackie Kitchen took the compound back to where it really belongs - the Great Northern main line. The first trip from Belfast to Drogheda was really a warm-up for the big one: the official Belfast - Dublin "Enterprise" the following week. When the big day arrived, Merlin set off with eight coaches in tow from Belfast (Central) to Dublin (Connolly). There were incredible scenes on arrival when many people who hadn't seen a compound in the Irish Capital for over 20 years gathered around the engine, along with others who were taking all this in for the first time. It was the start of a remarkable career. In May 1987, as part of the RPSI's major annual tour No.171 Slieve Gullion hauled the train from Dublin to Galway and back, but Merlin travelled from Belfast to take the train back north. No.85 was there to meet No.171's arrival, and for just a short time, two GNR(I) lined blue locomotives were once again in steam at the old company's headquarters. Then came the 40th anniversary of the "Enterprise" on 11th August 1987. It was the same length train as in 1947 (seven bogie vehicles) but this time the compound at the front was Merlin. The timings were the same as the original run (how often is that possible with main line steam?). But Merlin, complete with 4,000 gallon tender, ran to Dublin with no problems - and arrived at the stop block with minutes to spare on the 2¼ hour schedule. It was another milestone in the comeback of a wonderful engine. 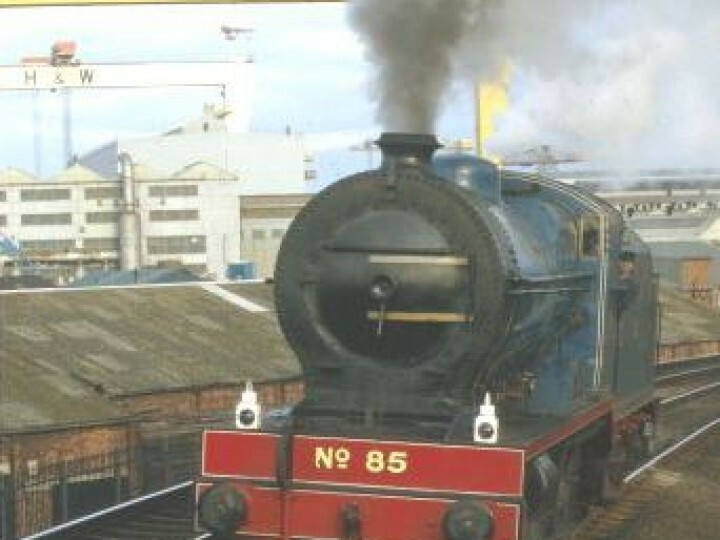 No.85 came out of traffic in 2004 due to the expiry of her 'boiler certificate'. She was on display during our "Summer Steam" open days for a few years until August 2009, when it was decided to explore the possibility of returning her to traffic. After major work, No.85 returned to main line passenger service early in 2014.